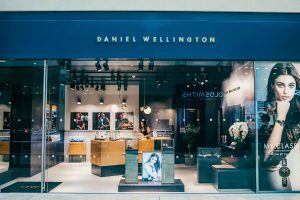 The St David’s Partnership, owners of St David’s in Cardiff, one of the UK’s premier retail and leisure destinations, has today announced the opening of Daniel Wellington’s first standalone U.K. store outside of London, at St David’s, Cardiff. The new 430 sq ft regional icon stocks the brand’s much revered range of classic and elegant timepieces. Combining minimalistic designs with timeless styles, the store offers signature watches for men and women as well as an assortment of versatile accessories including classic cuffs and interchangeable watch straps in NATO, mesh and leather. Designed by an accomplished in-house team, the interiors reflect Daniel Wellington’s classic yet contemporary design aesthetic. This follows the recent opening by international fashion brand Stradivarius, its first Welsh store at the centre, earlier in the year. JLL and Cushman & Wakefield advised the St David’s Partnership. Stephen Kane & Company represented Daniel Wellington.